I've had the Nars Ride Up to The Moon palette in my possession for a while, but since I wanted to show it in a haul, so I didn't use it. Now that's ultimate pathetic blogger problems! So since I've ticked that box and shown it in a haul (see here) I've taken to using it almost every day. 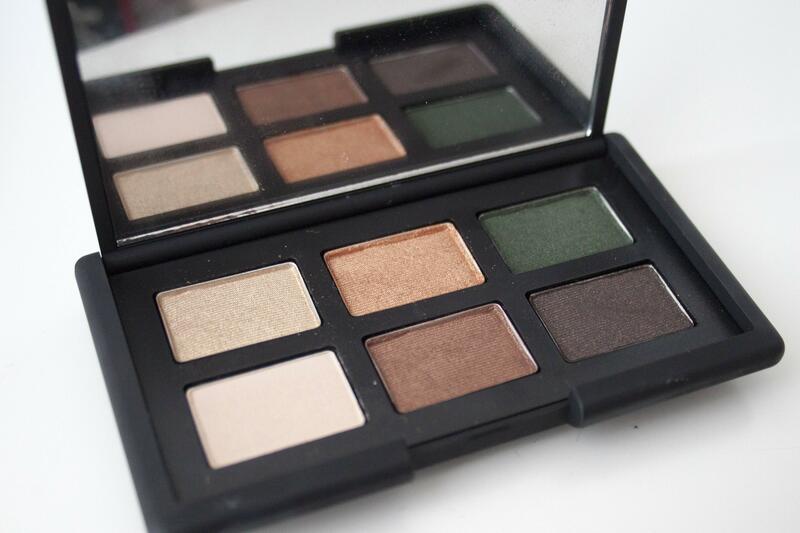 To give a speedy rundown of the deets, It's a beautifully housed edit of 6 fall ready shades of eye colour from Nars. The shades included within the palette are (from left to right, top row then second) Argentina (pale gold), Isolde (metallic amber), Night Porter (deep green), Biarritz (matte cream), Fez (cocoa brown) and Cordura (dark brown with gold flecks). All the shades are utterly butter soft and remarkably pigmented. I found the only one that is slightly off is Cordura which I found to be slightly chalky. They lasted a good 9 hours without primer and didn't crease on my oily lids. LOOK ONE is my usual everyday look but adapted using some new shades. I popped Isolade onto the lid then blended with a touch of Fez in the crease to define the eye a little. Then took Isolade under the bottom lashes to make the eye pop. I then lined with a liquid liner as usual and finished with my everyday mascara. Isolde is a shade I've had my eye on for yonks. I just didn't want a single eyeshadow of it as I knew it would get lost in the shuffle. It's positively lived up to my expectations and now wondering why I never caved sooner. LOOK TWO is a dark, smokey, evening eye shadow look. Not a look that I've ever created before, but I can see myself wearing it again somewhere down the line. I've never experimented with dark eyes, however paired down with a bronzed base and neutral lip I think it looks quite gorgeous. For this, I used Argentina all over the lid as a base, then blended Night Porter over the top to create a shimmery green with gold flecks. I took Cordura and lightly buffed into the crease and then ran it under the eye to smoke the whole look out. To finish I lined the eye with a creamy black eye pencil (I did use gold originally but didn't like it!) and blended it out with a small brush on the upper lash line to create a little more definition. I'd probably need to wear false lashes with this look as I felt my eyelashes got a bit lost in the look! But I really like how the green compliments my green blue eyes, I wasn't sure it'd work as well as it did. This palette is a limited edition, and I suggest getting your mitts on it ASAP if you're curious about it. At £32, it's not terribly priced for 6 amazing quality shadows in 6 wearable shades. I often find with pre designed palettes there is always those odd shades that just don't work quite so well. Despite my original doubts about Night Porter (the green), it actually works really well within the overall colour palette and provides a much needed colour pop against the neutrals. I'd also had my eye on Isolde previously so it's nice to see that in a palette as I'd never in a million years use up a entire eyeshadow! In conclusion In all think it's utterly beautiful and varied eye palette. Creating anything from a simple matte neutral eye to a deep smokey look with a pop of green. Have you entered my giveaway to win you're own Ride Up To The Moon Palette?